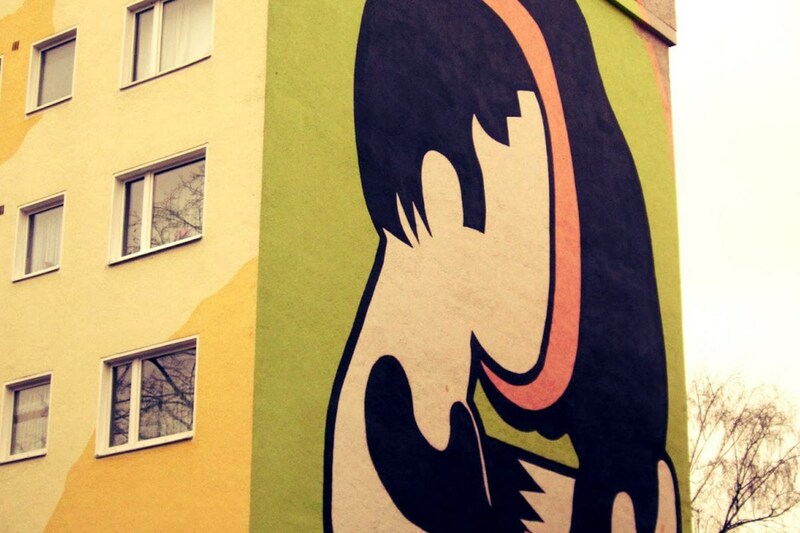 What are the Hottest Names of Street Art in Germany Today? 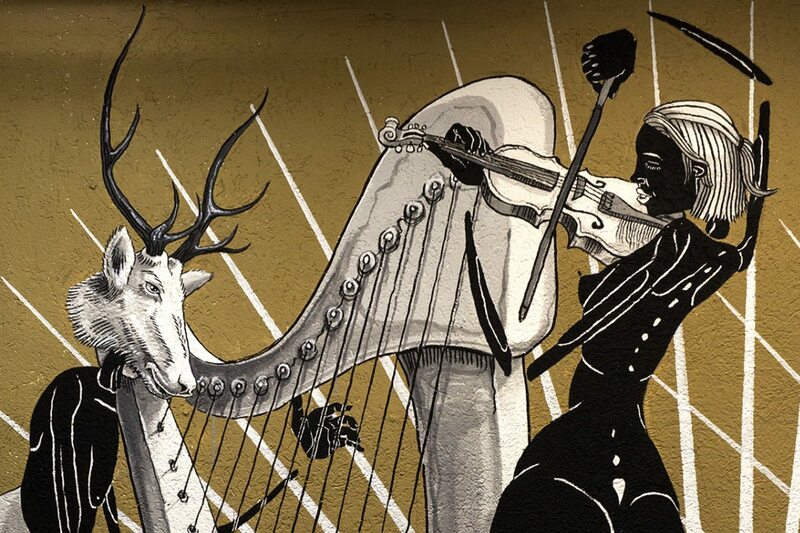 Although our blog is mostly dedicated to street art in Berlin, getting to know parts of the bigger picture is important as well, so this time we bring you some of Germany’s top street artists. We have already introduced you to Berlin’s very best before, but here is a quick reminder: we were talking about XOOOOX, the stencil masters Alias and Negative Vibes, the humorous El Bocho and Mein Lieber Prost, the witty French artist SP38, the amazing Various & Gould duo and the Argentinian-born Alaniz. Now, after you’ve opened those new tabs and checked them out, it’s time to scroll down and meet the rest of Germany’s Street Art scene. Hendrik Beikirch, better known under his short alias ECB, is a German street artist from Kassel, who currently lives in Koblenz. 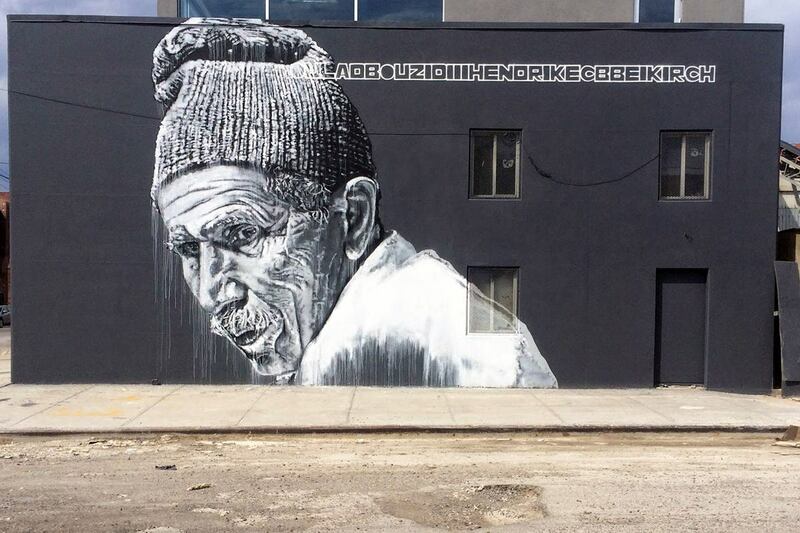 ECB is a world famous artist who describes himself primarily as a painter, who simply happens to be painting on large, public, vertical surfaces (walls). His honest and intimate approach to portraiture reveals all the imperfections and real facial features of the people that he represents in his monochromatic murals. His art mostly belongs to meticulous realism, but it sometimes wanders off into depicting surreal, alternative versions of existing faces. In any case, his portraits aim to reveal the unique, special human traits that make us individual and different from anyone else. 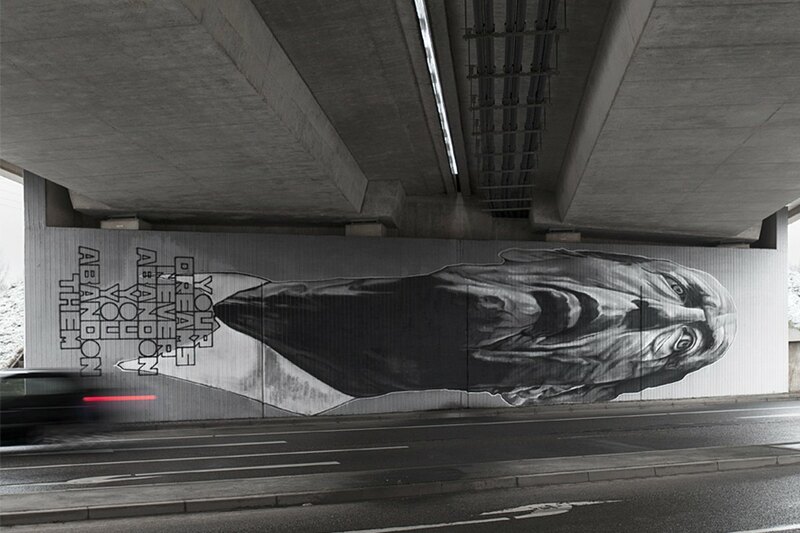 He works both outside and inside, in public and private spaces, on canvas and on walls, and he is definitely one of the exceptionally gifted street artists that Germany should be proud of. CASE is one of the four members of Maclaim crew, which was founded in 2000, and it is known as one of the first groups to pursue the photo-realistic style in the global Street Art scene. 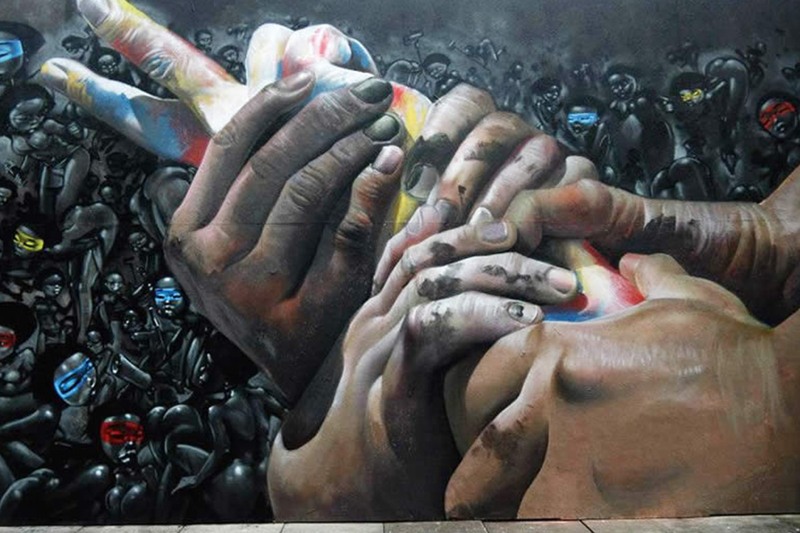 Andreas von Chrzanowski (which is CASE’s real name) is a Frankfurt-based artist, whose murals often depict human faces or body-parts, especially hands. These hands usually express certain gestures and symbolize other things and meanings. CASE often paints on various surfaces, and not exclusively on walls. He also uses backgrounds such as cardboards and similar materials that have strong texture, which gives an additional flare to his art. Just like ECB (with whom he sometimes collaborates or travels), CASE is an internationally acclaimed artist, who is often invited to participate in projects, festivals, commissions, etc. You will find his works almost anywhere in the world, and if you want to see the place where it all began, you should visit East Germany, where he started out in 1995 as a graduate from Erfurt University Of Applied Sciences. Based in the southwest German town Karlsruhe, DOME makes an important addition to this list. He started experimenting with graffiti when he was relatively young, in his early twenties, and not long after that he started exhibiting in galleries, and making a name for himself in the streets. Unlike the previous two masters of realism, DOME combines the surreal elements with illustrative drawing. His characters are often depicted in front of imaginary landscapes, patterns or shaded backgrounds, or sometimes overlapped with existing, three-dimensional elements from the surrounding. He often draws his characters on heavy paper, and then glues them onto different surfaces. DOME has an interesting technique that he revealed to the public at some point – he calls it modular construction. DOME makes his artworks out of pieces which are drawn in increments of 45 degrees. Emess comes from western part of the country, but he came to Berlin as a student and graduated from UdK Berlin as a Fine Artist. However, he soon found out that his work does not belong to galleries, but to the streets instead. The wide range of media that he uses includes sculpture, prints and murals, which are usually made on quite big surfaces. Emess tends to provoke the viewers through his works, or at least to provoke their thoughts. He aims to confront the spectator with the issues that they would avoid to honestly discuss or even think about. 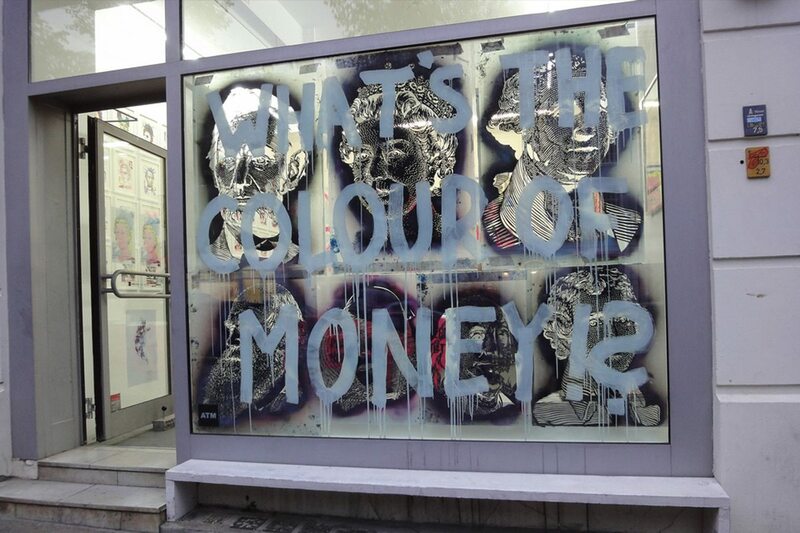 One of the series that he is most famous for is What’s the color of money?, a set of artworks which shows the all-too-familiar portraits from banknotes. The portraits are accompanied by the titles of the songs which speak about the inherent human love and need for money. Nomad – Rounded Heads. Kreuzberg. Oppelner Strasse. One of the most peculiar German street artists with a very unique style, Nomad currently lives and works in Grunewald, Berlin. The range of techniques and representational aesthetics in his works is quite broad and versatile. He is obviously inspired by classical painting, especially by the Renaissance, but he does not go for the veracious, realistic representation in his own work. He often likes to point out, himself, how the matter of technique is irrelevant to him, and how the process of making is what really matters. His open-minded attitude, when it comes to art making, and his spontaneous approach go hand in hand with the incredible stories from his life. Although he used to live and work in Berlin for a while, at some point he ended up in San Francisco, living as a homeless artist, sleeping in the streets or in the park. The story goes as far as to bring up the details, such as the fact that he used to wash himself in the McDonald’s bathroom. His moniker therefore suits his miraculous life story, as he truly is a nomad. His work, humorous, emotional and completely original, is now recognized as exceptional and worthy of admiration.